When it comes to weaning your baby, finding a bib that will contain all the mess, yet is comfortable at the same time can be a bit of a boring task. It's also quite hard to find a bib that is easy to clean and won't stain after the first wash. I found that a lot of the bibs that I first used were material ones that don't stay very fresh looking for long. You only tend to get one use out of them before having to throw them in the wash. That's where the Bibetta Ultrabib steps in. 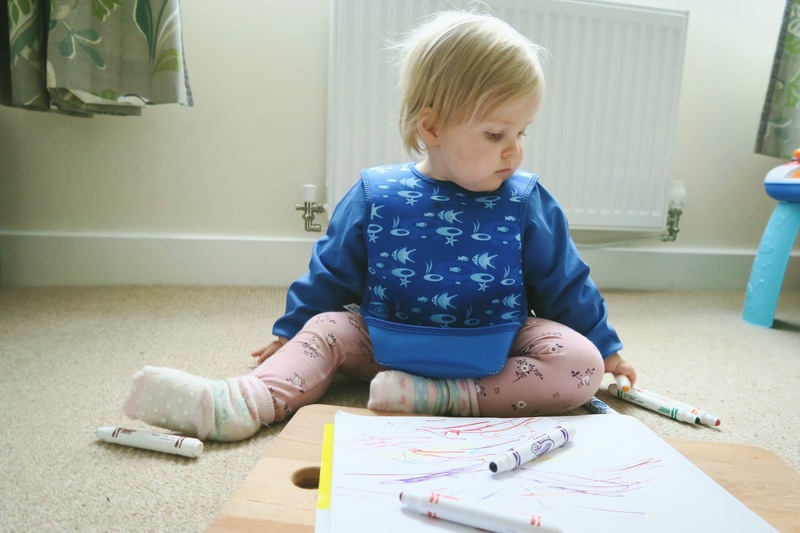 It is the one bib that I have found that not only works with weaning, but is amazing when it comes to arts and crafts as your baby gets a bit older. I first discovered the brand Bibetta through Emily and Indiana. I saw her using them with her son Parker and thought they looked great. At the time I was just about to start weaning Elise, so was on the hunt for some durable bibs that were easy to use, and clean, between uses. As Emily was using them for baby led weaning, I knew that they would work for us too, even though we weren't taking the baby led weaning route. I was attracted to the material of the bibs, and I hadn't seen many that had sleeves before. I was picturing Elise wearing them as she grew and knew that they would also be ideal when it came to arts and crafts sessions. The neoprene material means that it is easy to wash them in the sink after use, and they also don't stain. The material also prevents your child from getting soaked during weaning, and play time, as it is just like wet suit material. The fact that it is also waterproof means that they are great for water play and painting too. The Ultrabib also features a pelican style pocket that folds out so it can catch all the food that your child drops during eating. I also found that it was great at catching crayons and pens that Elise dropped. You can fold the pocket away when you don't need to use it which is great when you are doing crafts, as you don't always need the pocket getting in the way. I found that the flexibility of the pocket worked well. It isn't too structured, so it isn't hard against your little one. We have found that the harder bibs with pockets have been a problem when using them at the table as they hit the table and get in the way. As the Ultrabib is so flexible, it is easy for us to put Elise right up against the table in her booster chair without being uncomfortable. The Ultrabib is very easy to wash by hand after use. Due to the neoprene material, you can simply just use soap and water and wash it at the same time as your normal washing up. It can also be machine washed. We love this feature, as it means that you can use it all week as it is easy to wash it up at the same time as your normal plates and bowls. Other bibs that we have used have needed washing in the washing machine after one use, and for us it is just more hassle. I love being able to just wash the bib with soapy water in the sink after use and know that it will have dried ready for the next meal time. It is also easy to put on the Ultrabib. 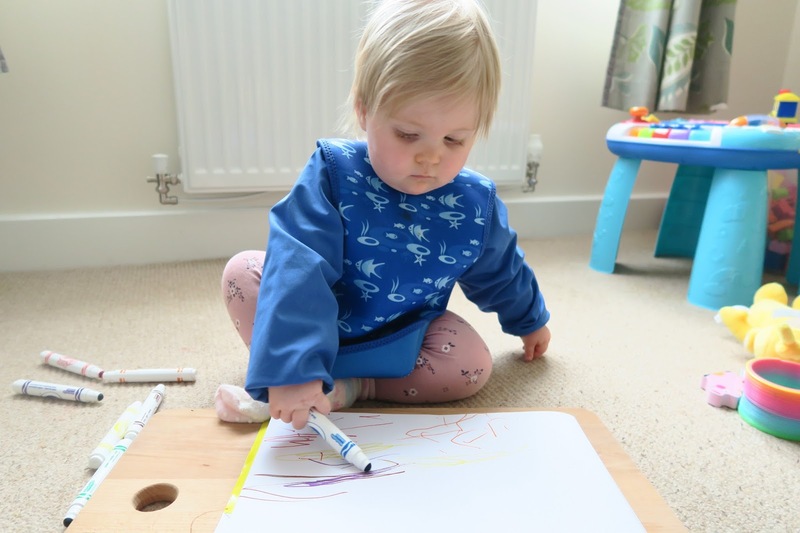 Babies and toddlers love wriggling when you are trying to dress them, but because this just fastens at the back with Velcro, putting it on and off is pretty pain free. My daughter now loves putting her arms through the sleeves and helping me. She knows that once she has finished eating to put her arms out in front of her so I can take it off in one simple movement. We've been using these bibs since Elise was 6 months old, and she is now 15 months and they are still in perfect quality. 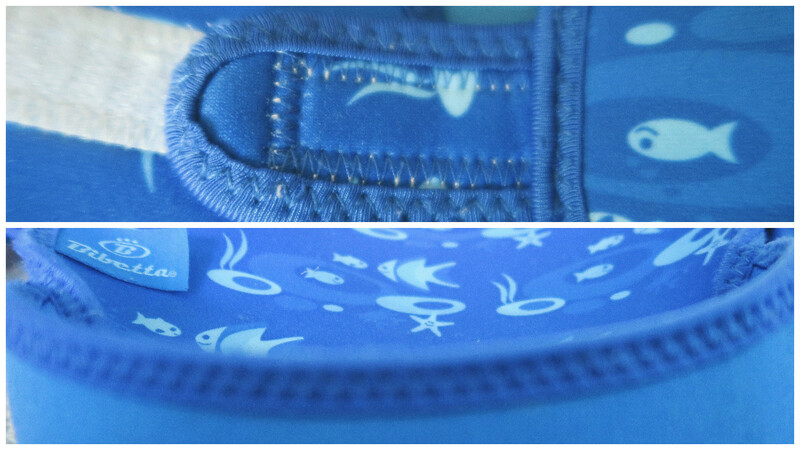 The stitching is all intact, there are no stains and the velcro is still working perfectly. We just make sure that we close the velcro when we do put it in the washing machine to prevent it deteriorating. We also love the designs of the Ultrabibs. We currently have the turquoise birds, blue fish and green owl prints. We'd collect them all if we could, but I feel like three of them are a good number to have. We keep one in the changing bag, and then have two for every day use. Saying that, we have been eyeing up the new Dinosaur print bib as Elise is a bit obsessed with pretending to be a dinosaur at the moment! 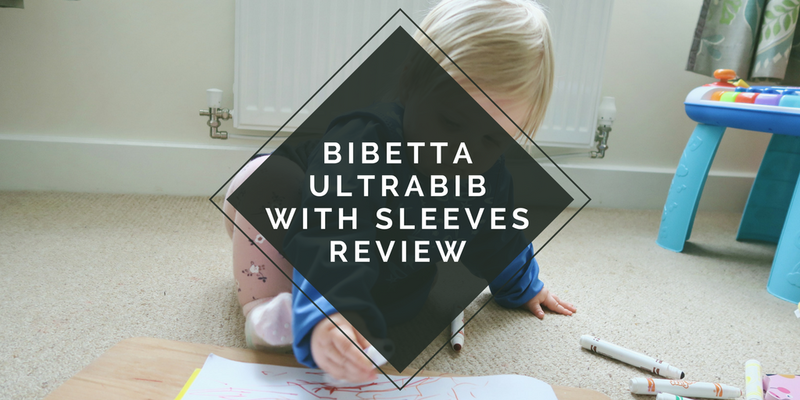 You can purchase the Ultrabib with Sleeves from the Bibetta Website for £11.99. At the moment if you purchase 2 or more Ultrabibs with Sleeves, you will get a discount of £1.00 per bib. Bargain! All items mentioned in this post were purchased by myself. We were not sent any items for review, and are not being paid for this post. Post contains affiliate links, this means I receive a small amount if anything is purchased through this link. This doesn't change the amount you pay. Oh! I love this bib! I had it for all 4 of my kids! The bib is so cute! I like the tip about wearing the bib so the pelican pocket can catch crayons! IT HAS SLEEVES?!?! Oh that's brilliant! And it's so cute! This bib looks comfy compared to the ones I have tried with my little one. I will have to buy it for her and see how she likes it! Beautiful Bib. And such a cute baby! That is beyond the cutest bib. We are over those days but definitely something I will look into once we expand our family. Very cool bib! So cute! I will have to try it for my 13 month old. Thanks for sharing! This looks great for messy play and meal times. We could do with one. Long sleeved bibs are so useful. This one looks a lovely fabric too. My kids are somewhat past the bib stage now, although I do sometimes wonder with the state of their school jumpers!! Bibs have certainly improved over the years. This one looks really funky as well as being a useful design.